After the cutting off of the Head of the Prophet, ForeRunner and Baptist John (Comm. 29 August), his body was buried by disciples in the Samarian city of Sebasteia, and the venerable head was hidden by Herodias in an unclean place. Pious Joanna, wife of king Herod's steward Chuza (there is made mention about him by the holy evangelist Luke – Lk 8: 3), secretly took the holy head and placed it into a vessel and buried it on the Mount of Olives – in one of the properties of Herod. After many years this property passed into the possession of the dignitary Innocentius, who began to build a church there. 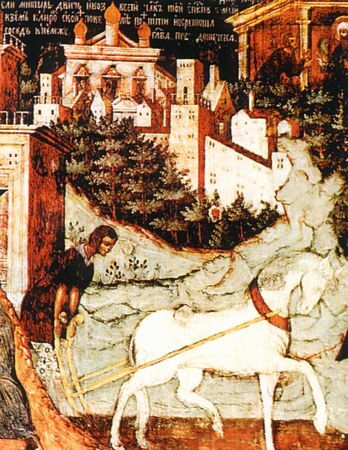 When they dug a trench for the foundation, the vessel with the venerable head of John the Baptist was uncovered. Innocentius recognised the great holiness of it from the signs of grace occurring from it. Thus occurred the First Discovery of the Head. Innocentius preserved it with great piety, but before his own death, fearful so that the holy relic should not be abused by unbelievers, he again hid it in that same place, where it was found...Upon his death the church fell into ruin and was destroyed. During the days of Equal-to-the-Apostles Constantine the Great (+ 337, Comm. 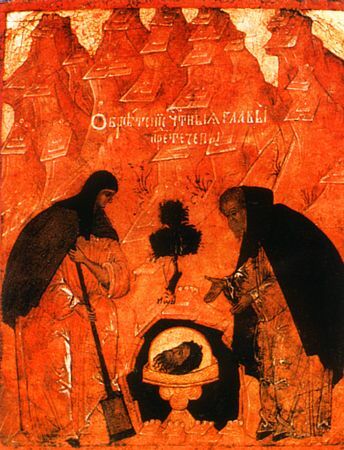 21 May), when the Christian faith began to flourish, the holy ForeRunner himself appeared twice unto two monks journeying to Jerusalem on pilgrimage to the holy places, and he revealed the location of his venerable head. The monks uncovered the holy relic and, placing it into a sack of camel-hair, they proceeded homewards. Along the way they encountered an un-named potter and gave him to carry the precious burden. Not knowing what he was carrying, the potter continued on his way. But the holy ForeRunner himself appeared to him and ordered him to flee from the careless and lazy monks, together with that which was in his hands. The potter concealed himself from the monks and at home he preserved the venerable head with reverence. Before his death he sealed it into a water-carrying vessel and gave it over to his sister. From that time the venerable head was successively preserved by pious christians, until the priest Eustathios infected with the Arian heresy – came into possession of it. He seduced a multitude of the infirm, healed by the holy head, adding abundance to the heresy. When his blasphemy was uncovered, he was compelled to flee. Having buried the holy relic in a cave, near Emessus, the heretic intended to afterwards return and again take possession of it for disseminating falsehood. But God did not permit this. Pious monks settled into the cave, and then at this place arose a monastery. In the year 452 Saint John the Baptist in a vision to the archimandrite of this monastery Marcellus indicated the place of concealment of his head. This became celebrated as the Second Discovery. The holy relic was transferred to Emessus, and later to Constantinople.